This section includes the “My Images,” “My Videos,” “My Documents,” and “My Articles” areas. The “Photos, Videos & Files” section is your personal library where you can upload all the customized content you want on your website – photos and logos, web videos, forms and documents, and articles you’ve written or edited. Uploading content to the “Photos, Videos & Files” section does not automatically add that content to your website. In other areas of the Control Panel, you select where to display that content. The first thing you’ll probably want to upload here are doctor photos, because they add an important personal touch to your website. We provide lots of stock images for you to choose from, but if you want to display any of your own images, you will need to upload them from your computer first. All these custom images are stored in the “My Images” section. You can upload your own videos or import video content from YouTube or other video-sharing websites in the “My Videos” section. 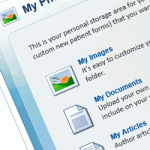 If you want to let patients download forms, instructions, or other documents from your website, you first need to upload them to “My Documents.” The documents must be in Adobe PDF format. The “My Articles” section is where you can save your own articles for your website’s Dental Info Center. You can save your personal edits to our stock articles, or you can write your own articles from scratch. Remember, adding custom content to your website is typically a two-step process: first, upload it to “Photos, Videos & Files;” then, select where you want to display it from the relevant area of the Control Panel.